How to Import Videos from Computer to iPhone? Question: "I need to check out videos at your iPhone instead of computer. But I don't know how to import videos from computer to iPhone. Can anyone help me?" While iPhone gives the most comfort and ease to the smartphone users, still a lot of people find it quite difficult to get videos from computer to iPhone. 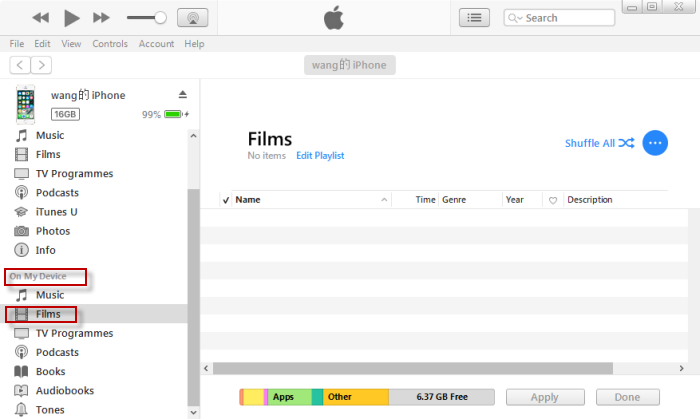 It is not very difficult to transfer videos from PC to iPhone if you could get help from iTunes. Step 1: Connect your iPhone to your PC. Step 2: Open iTunes. Please ensure that you have the most recent version. Step 3: Pick the substance that you need to add to your gadget from your iTunes library. Step 4: Look in the left sidebar for your gadget, and then drag the videos to your iPhone. For utilizing an iPhone, you can just include video from a solitary iTunes Library, otherwise, all of your data will be wiped out from iPhone. Step 1: In the left sidebar, click Summary. Step 2: Look to the Options segment. 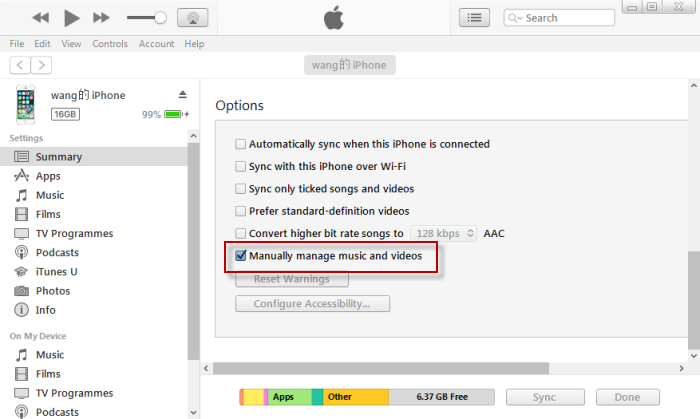 Step 3: Tap the container alongside "Manually manage music and videos". Despite the fact that iTunes makes it less demanding for the users to import videos to their iPhone, iTunes has disadvantages. To exchange documents from PC to iPhone, first you have to import them to iTunes library. In the event that you have non-obtained music on your iPhone, then those documents may be lost after synchronization. In case the iTunes crash, your entire backup will be lost. Due to many disadvantages of iTunes, most people try to find the alternative for iTunes to send videos from computer to iPhone and sync the data in their iPhone. Actually, iMyFone TunesMate is the best software available on market to replace iTunes and import videos/ music/photos from PC to iPhone. iMyFone TunesMate empowers users to add videos to your iPhone/iPad/iPod from the PC. You can watch your films in a hurry as well. Following are the steps to do so. Step 1: Launch iMyFone TunesMate on your PC, and connect your iPhone with a USB link. Step 2: Tap "Video" on the top tool bar. Then click "Add". If you need to add one video to iPhone, click "Add File". If you need to add multiple videos to iPhone, click "Add Folder". 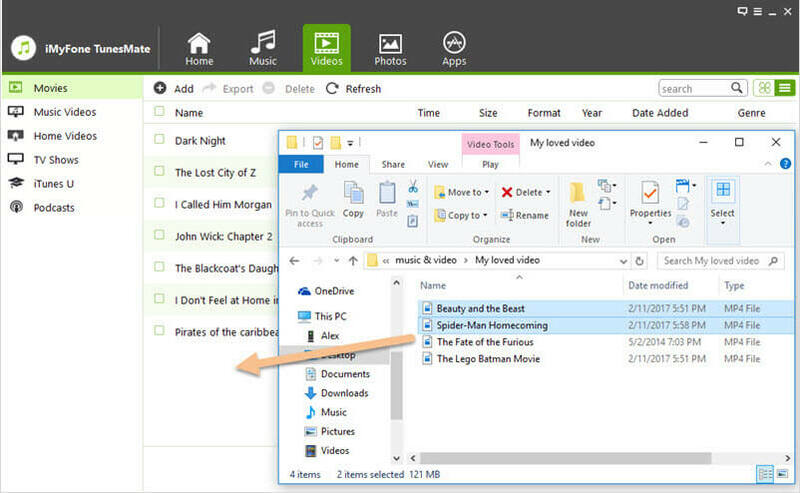 Step 3: Choose video or video folder from your computer. And click "Open" to start transfer. 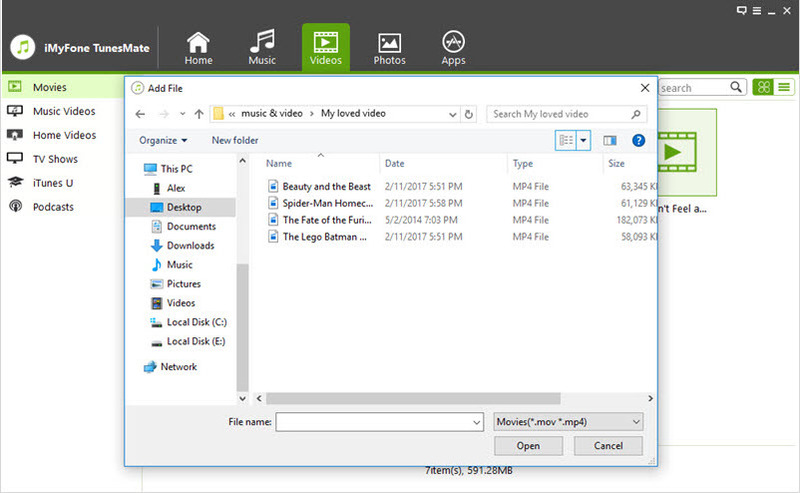 If you want to transfer Videos by Drag-and-Drop method using iMyFone TunesMate, you can also do that by following these steps. Step 2: Tap "Video" on the top tool bar. Step 3: Open videos file on computer that you need to transfer. 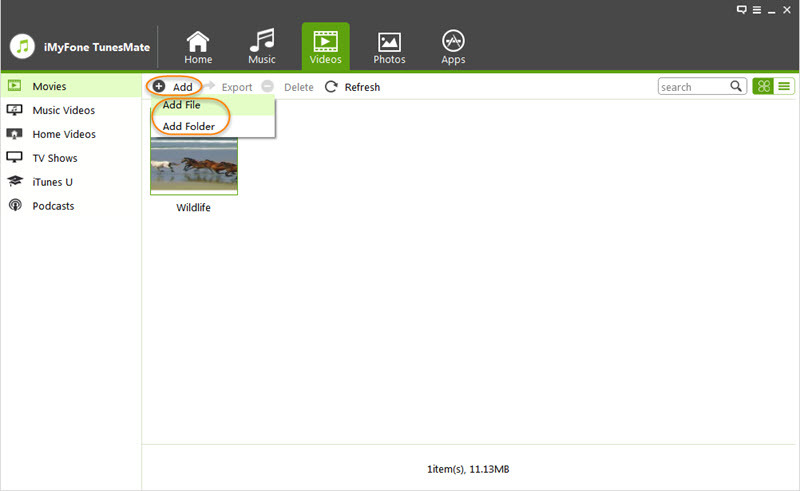 Step 4: Drag selected videos from computer to iMyFone TunesMate video folder and drop.